Arthur Churchill celebrates a milestone tomorrow that is reach by only a few. He will be 100 years old. And he is certain the secret to longevity is a regular drop of whiskey. “I have three drinks a day: one in the morning, one at dinner time and one before I goes to bed,” said the spry centurion in an interview last week. He also attributes his good health and long life to his eating habits. And for those who argue the dangers of smoking, Mr. Churchill is certainly the exception to the rule. He started the habit when he was nine years old he said and smoked for most of his life. He quit smoking only when he became plagued by bronchitis. 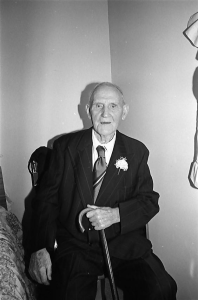 The former Hillview resident, who now resides at the Clarenville Rest Home, was born April 1, 1892, to William and Suzanna Churchill, one of eight children. And by the time he was nine years old he was already earning a living for himself, fishing with his father on the Grand Banks. Mr. Churchill recalls his first trip to the Grand Banks was also the maiden voyage for the schooner which his father built. During his lifetime Mr. Churchill pursued many other means of livelihood. In addition to fishing on the Grand Banks and the Labrador coast, he worked as a lumberjack and spent 30 years in St. John’s as a carpenter. In 1916, at the age of 24, he married Bertha Goobie of Queen’s Cove. They had four children, three of whom are still living. Two sons, Albert and Woodrow, live in Hillview, while a daughter, Laura Whalen, resides at Bauline. Mr. Churchill’s descendants also include 11 grandchildren and several great-grandchildren. Of life in Newfoundland in the early part of this century, Mr. Churchill says it wasn’t easy. “There were people who had to live on seven cents a day back then,” he said. He noted, as well, that household chores in those days included growing vegetables and fishing to keep food on the table, chores that saw him and his wife work side by side through their years of marriage. 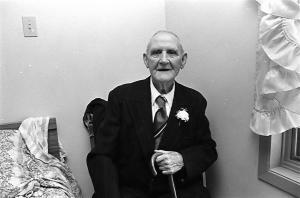 His wife died in 1979 and Mr. Churchill continued to live at Hillview until his move to Clarenville about six years ago. 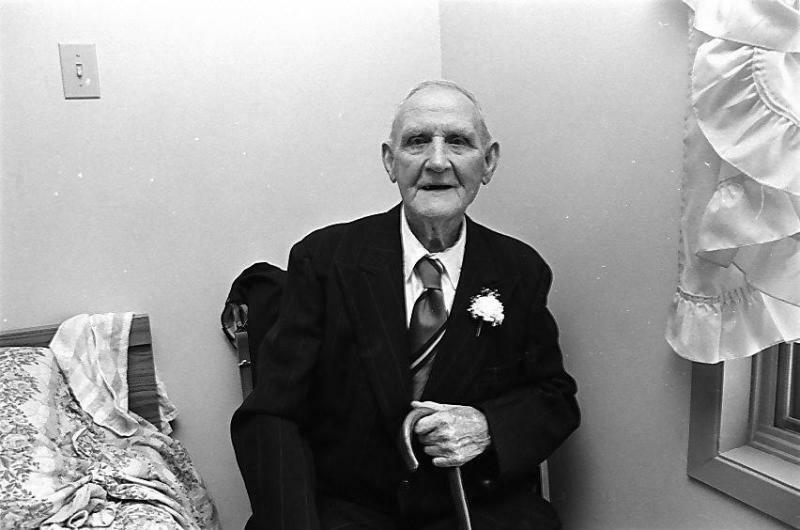 Mr. Churchill’s birthday is also a milestone occasion for the Clarenville Rest Home. It is the first time 100th birthday for the home. To mark the occasion the staff and residents are planning a party for Mr. Churchill and his family on the afternoon of the 100th anniversary of his birth.